Wearable devices are all rage among the various manufacturers these days and everyone seems to be trying hard to get successful at wearable devices. Google recently unveiled Android Wear, acknowledging the interest in wearable devices. Now, Toshiba has done something different. They haven’t launched a new wearable device but they have launched new application processors for wearable devices. 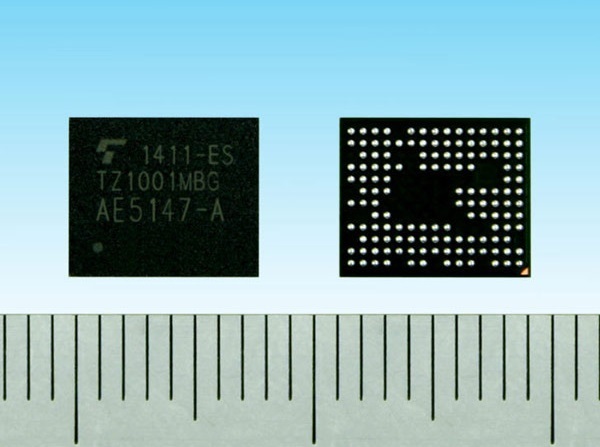 Toshiba has announced a couple of new processors aimed at wearable devices – TZ1001MBG and TZ1011MBG. The TZ1001MBG application processor features an accelerometer, processor, memory and low energy bluetooth. The first shipments of the TZ1001MBG will start in May while the SoC will go into mass production in September this year. The TZ1011MBG is the higher end of the two. It features an accelerometer, processor, memory, low energy bluetooth, gyroscope and magnetometer. The new application processors will be part of Toshiba’s ApP Life products. Toshiba says that since their applications processors are small and low on power consumption, they are the ideal choice for wearable devices. It is truly a bold step by Toshiba and it’ll be interesting to see if manufacturers use the new chips from Toshiba for their new wearable devices. We’ll surely let you know if that happens.